Geppetto's AutoDoc feature provides instant detailed connection information for all pin assignments, chip configurations and features, and links to manufacturers' technical specifications. Gumstix®, Inc., the leader in design-to-order embedded hardware systems, announced the release of AutoDoc, a new feature in the Geppetto® Design-To-Order (D2O) system. The AutoDoc feature creates free automated technical documentation with each hardware device designed and saved online in Geppetto® D2O. Geppetto's AutoDoc feature provides instant detailed connection information for all modules in a user's design, including pin assignments, chip configurations and features, and links to manufacturers' technical specifications. Free AutoDoc PDFs are generated automatically from the most recent saved version of a user's design in seconds, delivering valuable information to developers, engineers, designers, and their teams. "Today if you can get a kernel working with a board in a week you are a star, " says Gordon Kruberg, Gumstix CEO, "AutoDoc is revolutionary to the work process, eliminating hours of work in an instant, and putting all relevant technical specification information into one location." A layout diagram, a 3D-rendered image, and connection and power graphs provide graphical representations of the design while details like bus addresses, interrupt GPIOs and included ICs are included in the module descriptions to help programmers get an early start on development. Modules are indexed by category and hyperlinked within the document, instantly creating an informative, easy-to-navigate user manual. 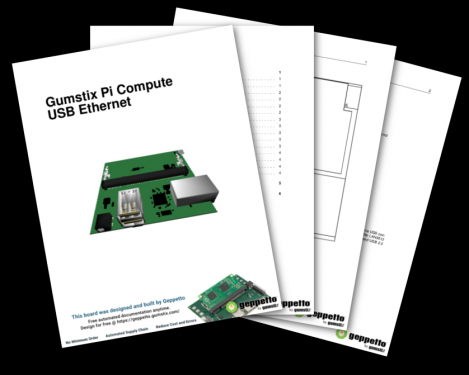 Review a complete Gumstix Pi Compute USB-Ethernet AutoDoc (https://www.gumstix.com/images/gumstix_pi_compute_usb_eth...) built for the Raspberry Pi Compute or design and save a board in Geppetto (https://geppetto.gumstix.com/#!/)® to use AutoDoc. Geppetto (https://geppetto.gumstix.com/#!/)® D2O (https://geppetto.gumstix.com/#!/), is a free online design and production tool for creating custom expansion boards. A hardware design can be completed in hours, and ready to ship in fifteen business days. During the design process, users can compare alternatives for features and costs, create multiple projects, and go straight from a design to an order in one session. Gumstix engineers verify all Geppetto-manufactured devices before shipping. The initial total manufacturing cost is $1999 with reduced rates for quantity discounts and repeat board spins. Gumstix products and quantity discounts are available at the Gumstix online store (http://store.gumstix.com). As a global leader in design-to-order hardware and manufacturing solutions. Gumstix® gives its customers the power to solve their electronic design challenges with Geppetto® D2O -- the online design-to-order system -- and a broad portfolio of small computers and embedded boards. In addition to engineers and industrial designers, Gumstix® helps students, educators, and makers unlock their creative ideas to bring them to market. Since pioneering the concept of an extremely small computer-on-module (COM) with a full implementation of Linux in 2003, the company has grown to support over 20,000 diverse customers. Gumstix systems have launched some of the world's coolest products - from phones to drones - on commercial, university, and hobbyist workbenches in over 45 countries. For more information, visit www.gumstix.com.